Last Friday morning at about 0300 saw the highest surge levels at the mouth of the Thames estuary since the Barrier was built. The Barrier was shut to protect London from the surge. The storm tide forecasts worked well with an indication that there could be a big storm surge event being available early in the week. Communities all the way from the Humber to Kent and later on the south coast were warned that flood levels could be as high or higher than the great flood of 1953 which led to the construction of the Barrier. As things turned out, the surge up the Thames was not as large as 1953 but still led to the highest levels at Sheerness at the mouth of the Thames since 1983 when the Barrier was built. The Barrier and associated defences are designed to cope with a storm larger than 1953 and currently provide at least a 1:1000 defence standard to London and most of the Thames estuary. This event provides a reminder that London is exposed to flood risk. 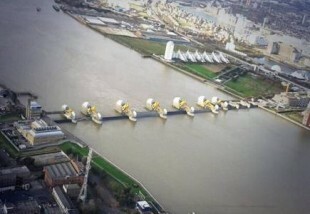 It is well protected by the Thames Barrier from tidal surge, but no system is without any risk at all. The Environment Agency and LCCP partners therefore work together across London led by the London Resilience team to prepare for the effects of flooding. There are various forms of flooding: tidal flooding is very unlikely, but not impossible, whilst a more likely form of flooding is surface flooding as a result of heavy rainfall. There is also a risk from the tributaries of the Thames flooding through London. We have initiatives such as the Drain London project which are actively looking at how best we can reduce this risk. This project has helped in putting together national surface water flood maps which have been made available this week on the Environment Agency’s website. They will help boroughs and communities prepare plans to cope with extreme rainfall events. In the wake of Superstorm Sandy in New York and other major flooding events we can reflect that we have a well prepared system to prevent and cope with the risk and impacts of flooding. However as the climate changes we need to appreciate that the risk of flooding in London will increase. The Environment Agency has a long term plan to adapt the Thames tidal flood management system to cope with rising sea levels throughout the 21st century. This TE2100 plan is designed to be flexible and adaptable to future conditions. We are planning for 90 centimetres sea level rise by 2100 and we can bring forward or delay major investments depending on changes in the actual or forecast rate of sea level. Currently we are embarking on a major programme to maintain the existing flood management system over the next 10 years or so. Given current plans we can manage with the existing Barrier until 2070. In the London Climate Change Partnership we are actively supporting the Mayor and others to cope with the other major impacts of climate change that are projected to occur through the century with growing impacts of heat waves and droughts. We are working with other major cities such as Rotterdam and New York so that we can learn from each other how to cope with a different future. The surge of 6th December reminds us that we live with risks from the sea and the weather. Such risks have always been present. They will increase with climate change and we need to work together to cope with them. Tim Reeder (BSc, CSci, FCIWEM) is the Regional Climate Change Programme Manager in the South East Region of the Environment Agency. Click here for further details.